Cathy and Andy got married at Deer Park Hall and held their wedding reception at the Worcestershire wedding venue too. Candid wedding photography (also known as documentary wedding photography or reportage wedding photography) is all about taking photos when people don't know you're there as to not influence the image itself, and at the same time capture beautiful images that are capable of telling the story of a wedding day without having to use words. People often assume that candid wedding photography is really easy, and whilst knowing how to use and work a modern camera is always going to be part of the task, it's by no means the biggest part. Being in the right place at the right time is incredibly important, as is knowing where to look. It's knowing to look at the father when he sees his daughter in her wedding dress for the first time on the morning of her wedding. It's knowing to look at the wedding guests during the best man's speech instead of always looking at him. It's very easy at a wedding to solely focus on the bride and groom. After all, the day is all about them and their love for the other. Whilst a lot of wedding photos are going to focus on the bride and groom, you can't possibly tell the true story of someone's wedding without photos of other guests. For this reason I always make sure to keep an eye on the bridesmaids during the wedding ceremony. The bridesmaids can be a gold mine for wedding photography, and you can often see the full gamut of human emotion in a single 30 minute wedding service. From laughing uncontrollably, the sly smiles at beautiful moments and the tears when things get emotional. I really like this image from Cathy and Andy's Deer Park Hall wedding. 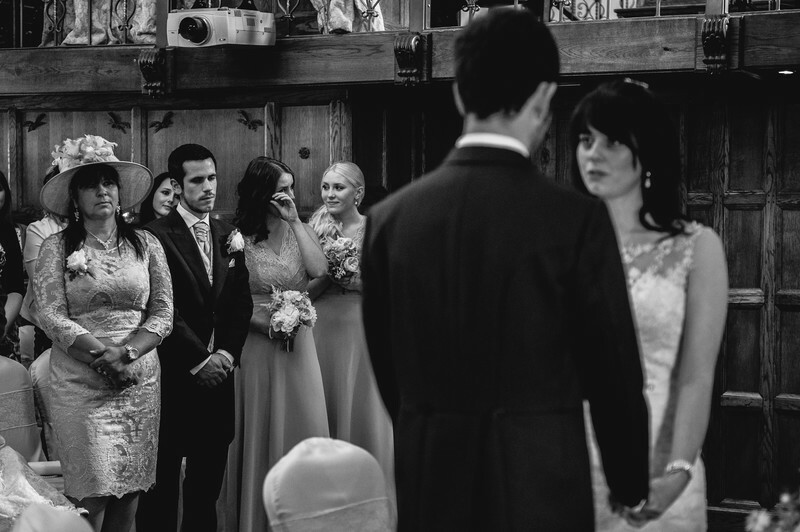 Whilst the image contains the bride and groom, the focus has perfectly been shifted to the bridesmaids, both of whom are showing emotion, but one is clearly showing a lot more than the other as she is busy wiping a tear from her eye.